So many fabulous Christmas projects around the interwebs lately! I’m terribly jealous because I pretty much only have time to pin to my Pinterest page and dream of next year. I’ve decided that I’m going to completely block off November and December next year for holiday sewing! I’m sewing the binding down on my penny sampler. How exciting is that?? As soon as that’s done I’ll be on the lookout for the first available moment for some decent photos. I’ve been setting up my new sewing room, and getting used to sewing in it. I’ll be sharing much more about that when it’s in a more presentable state. This week I’m painting the walls and soon I’ll be making curtains out of this voile I finally found an excuse to buy. I would seriously buy that fabric in every color of the rainbow if it was regular quilting cotton. But I’m the most excited about the present I am making for YOU! Ok, so technically no longer a WIP. This went together much faster than I expected. I’m usually pretty shy about 3-dimensional objects but I was determined to conquer this pattern because it’s such a cute & useful item. I’d love to have a whole bunch of them to organize my scraps. It also seems like a great go-to pattern for baby shower gifts (you know- when there’s just not time for a quilt). 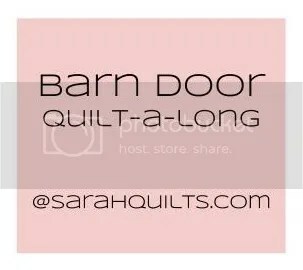 In case you missed it, I’ve posted the fabric requirements for the barn door quilt-a-long. But DON’T PANIC. We won’t be starting until after the holidays! I took advantage of the Fat Quarter Shop black Friday sale and ordered the fabric for mine. I’ll share that as soon as it arrives. That is going to be some happy mail! Linking up with WIP Wednesday and NTT! This entry was posted in Uncategorized and tagged Noodle-head divided basket, Sewing room, WIPs. Bookmark the permalink. Yay! A sewing room! Looking forward to seeing all your finished projects. Very jealous of all your SPACE! The basket’s very, very pretty, and some lucky person’s going to be delighted with it. Ohhh I’m so excited to see the Penny Sampler finished and to see your sewing space 🙂 Nice flash of your stash! Love your sewing room,just beautiful,Happy sewing! I am LOVING your sewing room! I have one too, but it is not nearly so organized. I love the idea of shelving inside the closet for your stash! I may have to borrow your idea, as I am in serious need of some organization. Currently, I keep almost everything scattered around in various shipping boxes on the floor. Not a smart use of space. :S P.S. 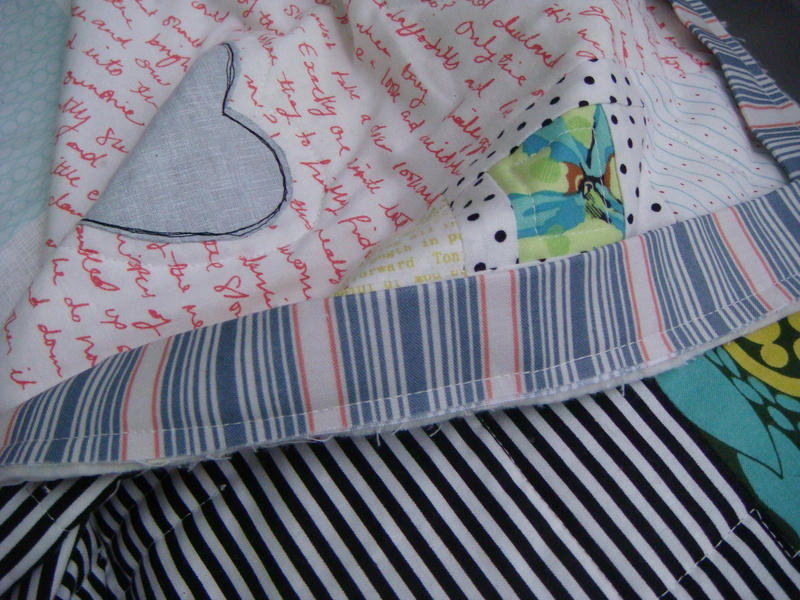 I bought some Botanics during the Fat Quarter Shop sale also (for a different quilt project, but still…). I also just received my fabric for your quilt along. I’ll take some pictures in the next couple of days – when this storm blows over and the lighting is a little better. Yay! Look at your stash so neatly organised in your sewing room! I also took advantage of the black friday sale at Fat Quarter shop, although it no doubt take a lot longer for my order to reach me. I can’t wait to see your Penny Sampler, I’m really excited about it, what a fantastic finish that will be! The Black Friday sales for fabric this year have been wonderful. I definitely stocked up a fair bit – it’s hard to say no when you’re going to buy it later anyway and the savings are so large. Sarah, I can’t wait to see your penny sampler. Nice picture of your sewing room, it looks great and so well organized. I am looking forward to seeing the quilt you are hand quilting. Hand quilting (to me) is so relaxing to do. The penny sampler looks so cute!! Enjoy your new sewing space! can’t wait to see your finishes. And can you remind me next November to start Christmas sewing too – I have left it much too late! SO EXCITED to see your sewing room. 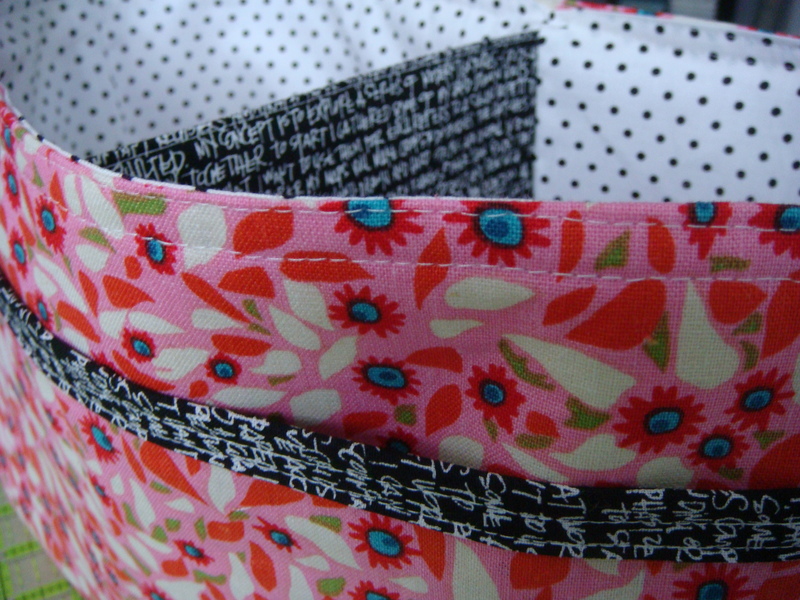 I bet it’s going to be fabulous – all that organized fabric makes my heart beat fast! Lots going on! How fun to be getting your new creating space. Keep up the good work. A room just for sewing would be so wonderful. You’re a lucky girl!! New sewing room, yay!!! 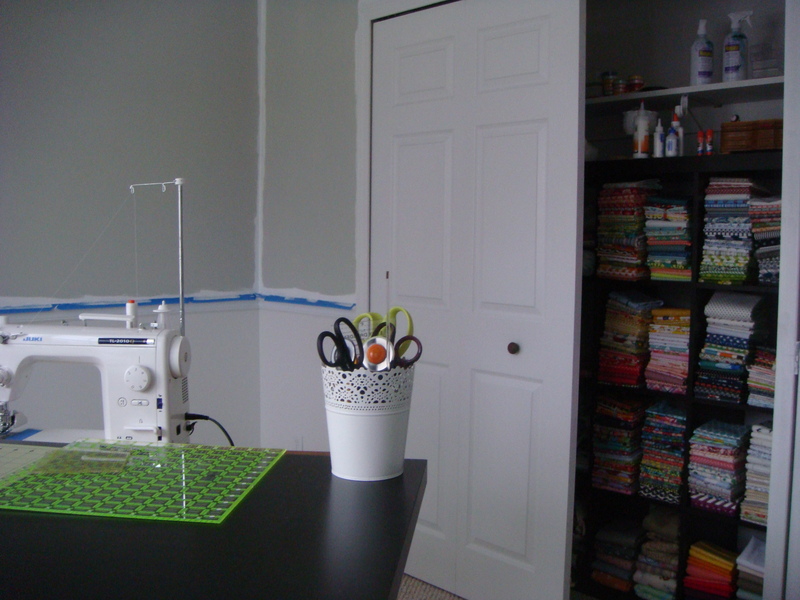 My new sewing room has grey walls too, and I love it! I wish I had a prettier way to display my fabric though. I am need of curtains, or something as well–your voile link didn’t go to voile. Congrats on the new sewing room and your stash cupboard looks awesome! Enjoy! Lovely basket too. that basket is too cute! They would definitely be a great tool for organizing scraps and strings. Next year I am doing my holiday sewing in July/August. I’m not even kidding. Sarah @ Stitching and Bacon just wrote that post about freaking out and feeling like an elf in a sweatshop and I am a little worried for my mental health as I also FREAK OUT about finishing all the Christmas presents. I can’t believe you are sewing Penny Sampler binding! You are a wonder, woman! Congrats on that sewing room, too–living the dream! What color(s) are you painting your sewing room?